As the year winds down, so too do the number of concerts happening across Canada, so instead, we're looking ahead to 2015's final day: New Year's Eve. If you're still in search of the perfect way to ring in 2016, or you left your planning until the last minute yet again, our special New Year's Eve edition of Can't Miss Concerts has you covered. We've picked up the best live music events taking place on December 31 for you to work into your celebration plans. Take a look at our picks for the occasion below, then relive the year in music via our 2015 in Lists section. Brothers Alexandre and Christopher van den Hoef, better known as DVBBS, will be ringing in the new year from their home and native land this year, with the first of two shows on their New Year's Eve itinerary taking place in Vancouver. For their new annual tradition, Vancouver brought a lineup as explosive as the fireworks set to go off. Current Swell are hopping over to the mainland, while hometowners the Matinée and We Are the City will open — the latter in support of their excellent Above Club LP. YOB will be Clearing the Path to Ascend — to 2016, that is. And really, is there a better soundtrack to "celebrate" the gloom of a new year than doom metal? Nomeansno are one of Victoria's quintessential punk bands, so it's only fitting that they'd cover some of the genre's founding fathers: NYC's the Ramones. The verdict's still out on whether the "Clones" part of the event means they'll be dressing up. Returning for its eighth straight year, One Night Stand is sure to deliver on its billing as Vancouver's best New Year's party. The evening's entertainment is set to feature members of Yukon Blonde, Rococode, Brasstronaut, Hey Ocean!, Hannah Georgas, Louise Burns and some surprise guests. Fresh off the plane from an earlier set in Vancouver, brothers Alexandre and Christopher van den Hoef (better known as DVBBS) will be dropping the bass as the headliners of Glitter & Gold at Calgary's BMO Centre. Whether Madchild has made "Squash beef with Snak the Ripper" a New Year's resolution of his own remains to be seen, but he'll be celebrating the arrival of 2016 with a set in Regina as part of the Pump Roadhouse's New Year's Eve celebrations. Known to play host to some incredible DJs, New Year's Eve 2016 at the Hoxton is no exception, with Bonobo set to headline the club's festivities this year. His DJ set will see support from locals Jeff Button and a live set from local producer the Kount. Like Nomeansno, Victoria's Dayglo Abortions wave their flag for BC's capital. The band haven't released a studio album in over a decade, but Holy Shiite can they still play live. Toronto's favourite cover band had the Danforth Music Hall packed for their annual New Year's celebration last year, and they'll surely do the same this time around. Promising special guests, special surprises and a room full of friends both new and old, this isn't one to miss. Celebrated alt-country trio Elliott Brood would like to give you the gift of a New Year's Day hangover from joining in their New Year's Eve-headlining celebrations at Lee's Palace. They'll see support from Grey Lands, helmed by Cuff the Duke's Wayne Petti and Billard Blossom. The Legendary Horseshoe Tavern will once again host equally notable alt-country crew the Sadies for their annual New Year's Eve festivities, where they'll play two sets. This time around, Robyn Hitchcock and Emma Swift will join them. After going to camp this past summer, Toronto promoters Wavelength are set to ring in the new year. The same care they put into curating their festival no doubt went into this lineup, too, so come early and stay late, even after the ball drops. Toronto indie rock heroes Hooded Fang head up a 6ix-centric New Year's Eve lineup at the Silver Dollar Room, which will also feature the musical talents of Petra Glynt, Sook-Yin Lee and Adam Litovitz's JOOJ, and DJs Colanthony Humphrey and Denz McFarlane Jr. of the OBGMs. Boston and Montreal collide in a punk party sure to satisfy. The sounds are noisy, fast and, at times, catchy. It's enough to keep you on your toes and your fingers pointed to the sky. When he's not parading around with wolves, Dan Boeckner is operating on electronic and rock music. This New Year's Eve, the surgery is public, so go watch Boeckner and his team dissect music and put it back together, all before 2016 strikes. Normally subdued strummer Matt Andersen will be brightening his blues with the addition of the Mellotones as a backing band, a partnership that's tried and true. Just ask the people of Halifax, who required two shows to meet the demand. For their second EP of 2015, Tupper Ware Remix Party suggested you Believe In Your Dreams, and that just got easier if your dreams involved ringing in the new year while dancing to some funky synth rock. Relive the year in music by checking out Exclaim! 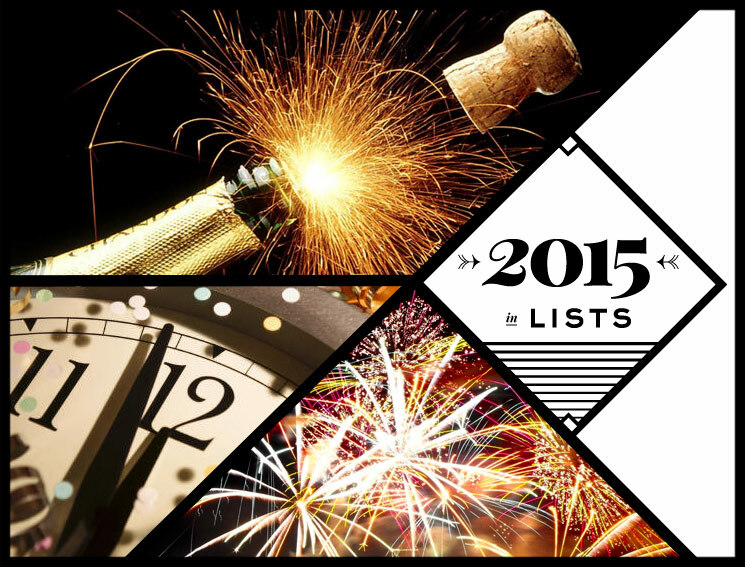 's picks for the Best of 2015.